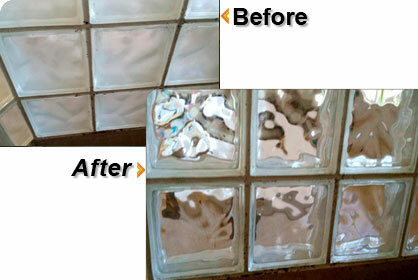 Shower Glass Water Spot Removal | HydroShield Coating | Weather Damage on Glass Cleaned. Our service is done on site with a written estimate before we begin; and all work is completed in a neat and timely manner for your approval. 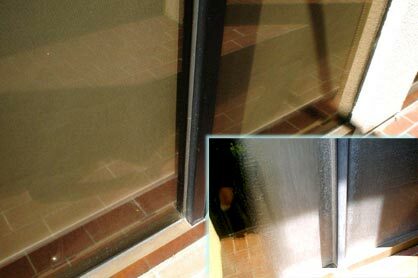 Take a look at the following pictures which show the dramatic example of our money-saving service before and after on block glass, and shower door glass cleaning. Take a look at the Valley Rose Tour Bus photo below. The windows were water stained and hard to see through, now they are clean and clear and ready for sight seeing & great photographs. I hired Shane from Saving All Glass to clean the windows on my Tour Bus. After years of hard water build up, I was not sure the spots would come off. I was at the point of having to replace windows, but, at over $10,000, it just was not in the budget and I was loosing business because no one could see out the windows. 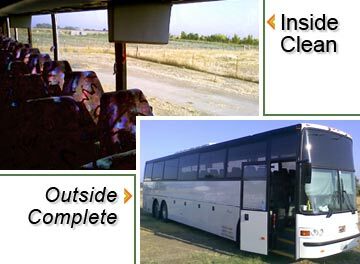 When you hire a tour bus for a sight seeing tour you would like to be able to see. I met with Shane and he assured me that he could restore my glass to almost new for less than a 5th of the cost or there would be no charge. When he finished I was very amazed. My window sparkled inside and out. My bus looked like a brand new coach. I would recommend Saving All Glass to anyone that asked and I will definitely use him again on any other glass problems.